Hello, I’m using OpenMediaVault and Docker to run my Blynk server. I got Blynk image from mpherg, I can access admin web page and create account from my Android device, that’s fine. BUT I can’t find a way to config mail.properties, I can modify server.properties file that I’ve bind the folder to Docker. I can edit, save, but when I leave and open again, the config didn’t save. 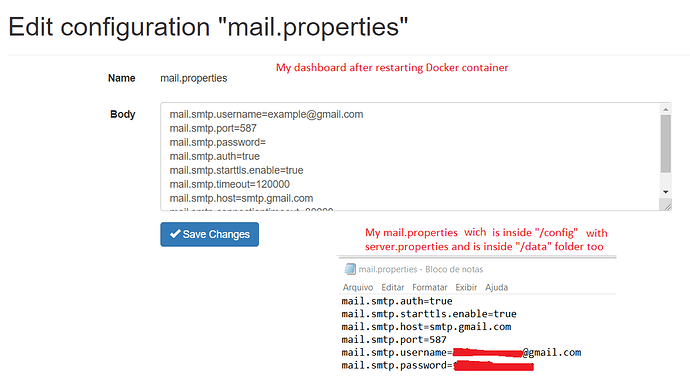 I didn’t find any information about mail properties in docker, neither why after saving It does not save at all in Dashboard. I can provide more info about installation if needed. I don’t think any editing in the dashboard works properly… saving for later development? Just use text editors in the folder and create/edit your file that way. 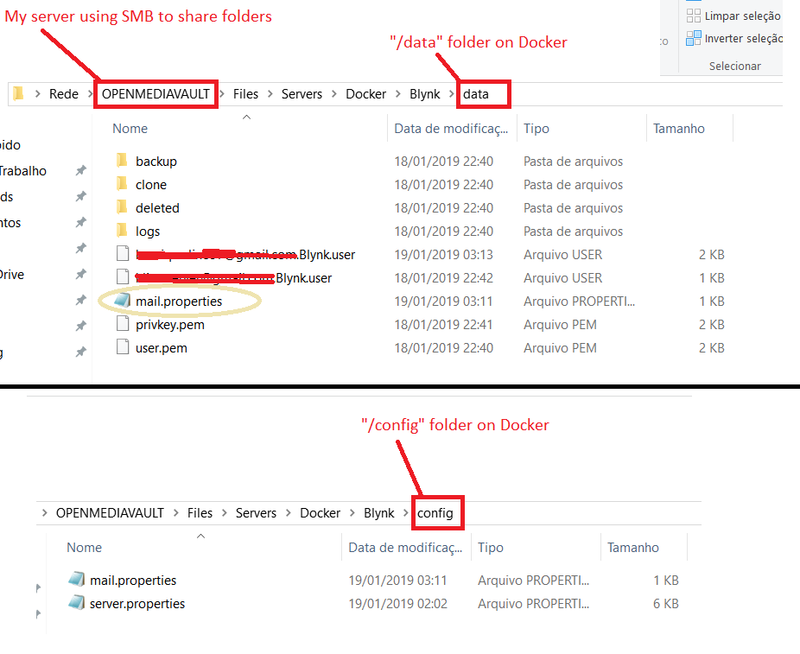 Just to clarify, I have a server running OpenMediaVault, running Blynk in Docker (which have his persistent folder), and the Docker folder of “/config” is shared over SMB to my notebook. The /config folder is where I put my server.properties and works fine, but I’ve tried to put mail.properties there and didn’t work. Since I don’t know where mail.properties should go and dashboard editi isn’t working, I’m lost here. It goes in the same directory. You can’t set mail.properties through the admin panel. You need to simply edit it with a text editor like Nano. This will let you bash INSIDE docker container. You may need to search where is your “server.jar” navigating trough folders using ls (to list folders) and cd “foldername” to enter it, and using ls again to view files inside that folder. This will copy yout mail.properties from /data to /blynk folder, then I restarted docker container and it works! I’ve OMV3 and various docker runing (unifi, logitech media server…) and all ok, but I’ve a problem with Blynk, don’t start. In the log “service stopped”. Can you help me to configure the docker plugin for run in OMV? Can you post your command to launch the docker instance @ackio ?